Summer is here, so let’s make the most of it while it lasts. For us Aussies, we know what each day of summer will bring — sun, sun or sun. And, we do know it will bring dating opportunities. Summer makes us all feel just that little bit happier, and the longer days mean we have the chance for longer, more exciting dates. Why more exciting? This is because the sun helps the body pump out the hormone serotonin, which helps you get into a really good mood. So the more time you spend outside, the more likely you are to feel better. To help you along the way we've compared the best Australian dating sites for you to try. There’s nothing more romantic than a picnic. You get the opportunity to relax, eat, drink, and enjoy each other’s company in the sun. Try to choose a location that isn’t too busy and make sure you go somewhere with a nice view or pleasant scenery. For something a little different, take a blanket and have a picnic watching the sunset. You can also try a midnight feast while you both go stargazing. Summer is the perfect time to hit up a theme park. Parks like Alton Towers and Thorpe Park pull out all the stops to make sure everyone has a great time. Doing scary things like riding roller coasters are brilliant for a date as they make the brain produce the same chemicals as falling in love. 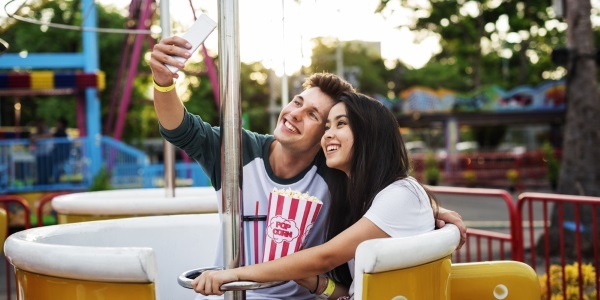 What’s more, you can bet that your date will love the opportunity to hold on to you as tightly as possible while on that roller coaster! Part of the fun is the anticipation queuing for each ride, which gives you the chance to really get to know each other. A movie is a traditional choice for a first date, but at this time of year you have the added bonus of doing it under the stars. There are pop up open air cinemas all over the country, which allow you to watch your favourite film with a date in a very romantic setting. Don’t forget to bring a rug to sit on and some refreshments to help set the mood. A visit to the seaside brings back fond memories from childhood. There’s so much to do, ensuring that you’ll have plenty of talking points. Go for a stroll along the beach, grab an ice cream, and don’t forget to order some fish and chips. If it's too hot outside, pay a visit to the amusement arcades, so you can show off your skills while having fun at the same time. If you don’t have a date yet, it’s time to take matters into your own hands. Fire up your BBQ and invite all your single friends to join you for a party. The condition is that they have to bring another single person along with them. Lay on the Pimms and you never know who might come along for you to meet. Remember, summer won’t last long, so make the most of the opportunity while you can. I hope you enjoyed these dating ideas.